A wine for all seasons, describes as a fountain of flowery aromas with a taste characterized by hints of quince, apricot, and almonds with a comforting creamy finish. A fountain of flowery aromas alerts first impression success! The taste is characterized by hints of quince, apricot, and almonds with a comforting creamy middle and a bold seamless surround. 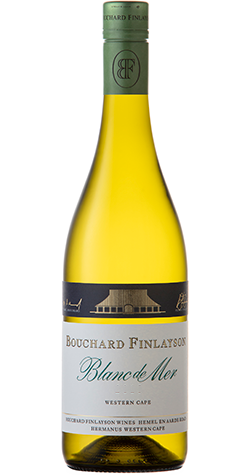 Fresh and vibrant, with a convincing strength and quality finish. Vintage 2017 set off to an early start reflecting the rewards of a flattering and comfortable summer season. This was a neat summer, grossly in contrast to the tough weather conditions experienced during the previous year. The cold winter during 2014 mid-year added to the foundation of a generous crop development and resulted in a rewarding offering at harvest time. Located in the wine ward of Walker Bay, an hour and a half from Cape Town, the 125-hectare property currently has 22 hectares under vines, the rest is mountain land, covered by the spectacular indigenous 'fynbos' flora of the Western Cape. Bouchard Finlayson's flagship wine is the Galpin Peak Pinot Noir, which has won many an award and accolade. Growing on the slopes of Galpin Peak, repeated vintages of this path-blazing wine continue to reflect a true celebration of Pinot-crafting, consistently endorsing the Hemel-en-Aarde Valley as a jewel in the hunt for this elusive grape.